Hindu Club de Resistencia Chaco (La Liga Argentina) tabbed 29-year old American forward George Valentine (203-101kg-88, college: Winthrop, agency: Blacktop Management). He played most recently at Club Atletico Talleres de Tafi Viejo. In 40 TNA games in Argentina he averaged 13.1ppg, 7.0rpg, 2.0apg, 1.3spg and 1.0bpg last season. 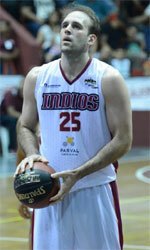 He can count that year as a very successful as was selected to Latinbasket.com All-Argentinian TNA Honorable Mention and League Player of the Week. The previous (16-17) season Valentine played at Umea BSKT (Basketligan) in league where in 24 games he had 11.3ppg, 8.4rpg (#2 in the league), 1.7apg, 2.0spg (leader !!!) and 1.0bpg. Good season as he was also here selected League Player of the Week (2 times). Valentine's team made it to the Austrian Cup final in 2014. He has played also professionally in Iceland (Tindastoll), Slovakia (Levice) and Austria (Gmunden Swans). Valentine attended Winthrop University until 2012 and it will be his seventh season in pro basketball.